At the local grocery store yesterday, a consumer was having a very difficult time with the customer service representative. The customer wanted to return four cans of olive oil, and the store employee was insistent that the store did not carry that particular brand and would not offer a refund. 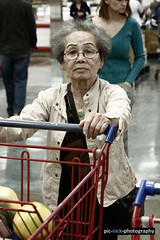 The customer started to get loud, and the customer service representative, in frustration raised her voice and tried to unsuccessfully explain to the angry customer that it was not the store’s policy to take back a product the store didn’t sell despite the customer claiming she indeed purchased the product at the store, although at a different location. The exchange escalated to anger until the store manager rushed over to mitigate a potential customer service nightmare. Consumers don’t care if the customer service representative is having a bad day, and it is the attitude that can make or break a tense situation. Using calming phrases such as, “here’s what we can do, “thank you for telling me,” “I’ll find out,” or “I understand why,” can make a huge difference in the satisfying outcome of the most stressful situations. Getting back to the basics of great customer service and never forgetting the cost of the loss of a customer and all of the people who the unhappy consumer will tell that could cost the loss of more customers, companies must help employees understand the importance of a positive attitude even when dealing with the most difficult consumers. Thanking the customer for communicating the problem, apologizing for the inconvenience and fixing the problem are what customers want and expect. As to the solution for yesterday’s problem when the store manager intervened … a store refund was issued to the customer with the manager’s apology. The customer took her shopping cart and proceeded to shop; the crowd of people waiting in line went about their own business without criticism and the incident was forgotten as quickly as it had begun. I agree! Customers don’t really care if we’re having a bad day or if our internal process are not what they should be, they just want what was promised (even if implied) to them in the first place. A quick response and followup to a complaint will help the issue from getting bigger than it needs to be. It is also a great time to practice our service recovery skills! Good article!